Mixed vegetable, traditionally made with potato, carrots, beans, peas, cauliflower and cooked with onions and tomato gravy, it’s a dish that tops the list when you eat out. 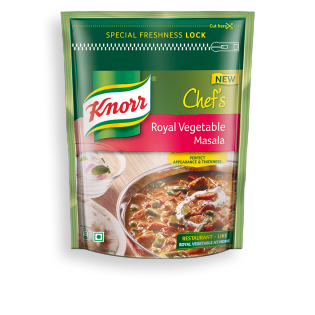 Bring alive that same restaurant-like colour and thickness at home with Knorr Chef’s Royal Vegetable Masala. What's in our Royal Vegetable Masala? 1. Cook Restaurant-like Royal Vegetable at Home 2. Made by Knorr Chefs 3. With 'Special Freshness Lock'- Keeps your spices fresh for longer 4. With Perfect Appearance & Thickness 5. With Knorr Chefs Masalas, you are the Master Chef of your kitchen 6. Chef's Tip: Garnish with chopped coriander. Serve hot with Rice or Roti. 1) In a Kadhai fry the chopped onions in the oil till light brown. Add chopped tomatoes, ginger - garlic paste, coriander powder, red chilli powder, turmeric powder and salt. Cook on low flame till oil separates. 2) Add the cut vegetables, into the onion tomato masala, cover with lid and cook on low flame for 20 minutes. 3) Add 1 Cup (150 ml)water along with 1 tbsp (8 g) Knorr Chefs Royal Vegetable Masala, mix well, bring to boil and cook till the vegetables are done. Serve Hot!